For seafront serenity, one-bedroomed Orhaniye Plaj in this pretty seaside village just half an hour from the resort of Marmaris is an ideal choice. Set in a peaceful spot in beautiful Orhaniye village on the Turkish Riviera, the villa boasts uninterrupted coastal views and is just steps from the beach and the turquoise Mediterranean Sea. Relax under shade in the garden while listening to the soft sound of the water lapping the shore, go for a cooling dip or find your prime sunbathing spot on the sand. Outside, the villa is classically Mediterranean in style with whitewashed walls and a red-terracotta tiled roof. Inside, the space is modern and bright with minimalist and comfortable decor, natural-coloured furnishings and floor-to-ceiling windows creating an extra feeling of light and space. Sleeping up to five, there's a comfortable sofa bed and an inviting sea-facing bedroom with two single beds and floor-to-ceiling windows, allowing you to make the most of the tranquil vistas. The open-plan living, dining and kitchen area is flooded with natural light and has direct access to the garden. There's also a large corner sofa, a flat-screen TV and air conditioning throughout for a relaxing home-from-home experience. In-between the living area and fully-equipped kitchen (including a washing machine and fridge), there's a dining space with a wooden table that can seat up to four. It sits next to the floor-to-ceiling windows so you can enjoy sea views with every meal. In the garden, there's also an al fresco seating area under shade and a BBQ. If you can bring yourself to leave this serene space, there are a couple of delightful cafes and restaurants within walking distance of the villa where you can try fresh and local Turkish cuisine. 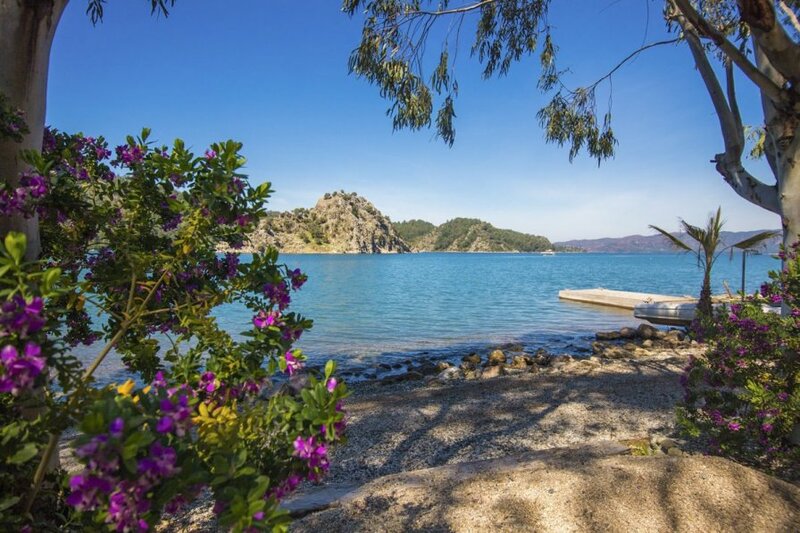 With the vibrant Marmaris Yacht Marina with waterfront restaurants and Bar Street Marmaris with clubs and bars both a short 17km drive, Orhaniye Plaj is well placed to explore more of this charming part of Turkey. Orhaniye Plaj is in a sought-after location, steps from the pebble and sandy-lined Zuzu Beach in Orhaniye village, on the southwest coast of Turkey. It's in a natural area with a pine tree-lined mountain backdrop. Local restaurants and cafes are within a short walk, while the more vibrant port city of Marmaris is 17km away, with restaurants, cultural sites and sports activities. Beaches are scattered along the Bozburun Peninsula. You can also jump on a boat trip to explore the scenic side bays, caves and islands the best place to pick up these is Selimiye. Selimiye is a pretty small resort with fish restaurants and small boutiques, and a prom to wander along. The fish restaurants in Sogut are worth a visit, with a view across towards the Greek island of Symi. Bozburun is where many of the wooden gulets are build and there are a few good eateries there. The usual tourist trail takes people to Orhaniye for it's legendary sand spit, Turgutkoy for the Carpet shop and waterfall, Bayir for it's plan tree, said to bring good luck and then to Osmaniye for the Beekeeping museum. If you chose not to hire a car there is a local dolmus that runs to Marmaris, here the 16th-century castle is worth a visit. It's perched on a hilltop and is draped in beautiful bougainvillaea flowers. Wander around the marina and harbour dotted with colourful yachts, alongside waterfront restaurants, cafes and bars serving everything from fresh seafood to meaty kebabs and savoury crepes. You can stroll along Marmaris's streets taking in the beautiful Mediterranean architecture or head to the boutique shops and bazaar to pick up everything from local honey to designer copies. Finish off your day at a Hamman (traditional Turkish bath) where you can relax with a full body scrub or massage. For a sophisticated evening dine at one of the restaurants overlooking the marina. On a Saturday the market in Datca is worth a visit. Drop off at the Olive Farm shop en route and take a stroll around the ancient ruins at Knidos to make a day of it. If that's too far Orhaniye has a smaller weekly market on a Saturday.